Choosing the best shops for any sort of ethnic cuisine is always a bit difficult, because markets in wealthy American cities often dictate what will and won’t sell. If palates in a certain area can’t handle particular flavors, or heat, or -- more importantly -- afford upscale rent, you’ll most likely have to journey into the suburbs for authentic cooking. Such is DC’s relationship with Thai cooking. While DC proper has its fair share of quality shops slinging spicy green curries, zesty fried fish, and crispy rice salads, if you really want to get at the Thai heat that will burn the tongue out of your skull, you’re probably going to have to take a trip into Maryland or Virginia. 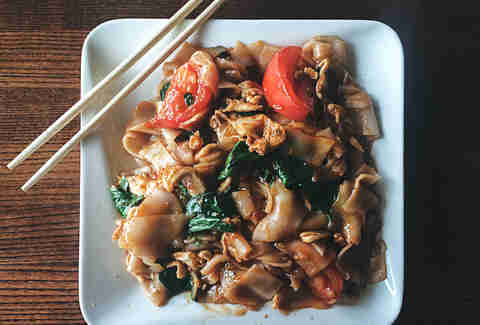 The following is a list of eight of the best Thai restaurants in the DMV, spanning a range of price points and neighborhoods (and heat levels). 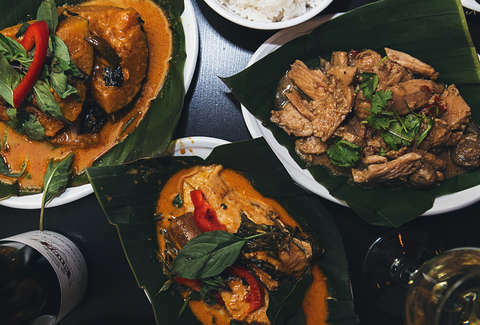 One of DC’s Thai legends, Thai X-ing is a prix fixe, reservation-only affair that is one of two names that are usually uttered in the same breath when the topic of Thai food is raised in this city (the other one follows below). $30 during the week and $40 on the weekends gets you five or six courses of family style Thai cuisine. 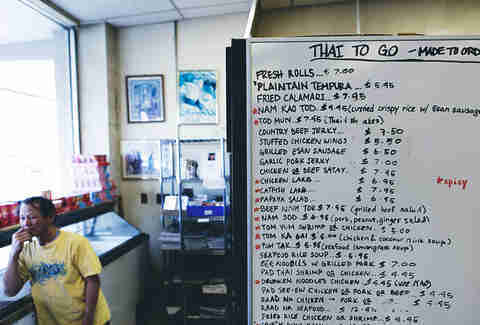 The menu varies from day to day, but generally begins with a soup, papaya salad, and some kind of satay. From there, one of the best known dishes in all of DC hits your table. The pumpkin curry is incredibly tender and covered in a mild red curry made aromatic by fresh basil. It’s at once creamy and hearty, with the silky texture of the squash and the balancing notes of heat and sweetness -- a highlight of an already excellent meal. Tucked away in a tiny strip mall (if you could even call it that) on a side street in Wheaton, MD, Ruan Thai has been serving authentic Thai cooking for nearly 20 years. From the staple drunken noodles to the fan-favorite, fried watercress salad, Ruan Thai’s menu is extensive and does not skimp on the heat. Ruan Thai doesn’t do anything too outside-the-box, but it nails the traditional flavors and the prices are more than reasonable. Bonus points for being next door to the beloved Ren’s Ramen, if you’re into that sort of thing. Situated in a maze of suburban shopping centers and back roads in Falls Church, VA, Bangkok Golden can be slightly hard to find, but it’s worth the trip. Chef Seng Luangrath may have just recently opened the white-hot Laotian Thip Khao in Columbia Heights, but Bangkok Golden is her first home. Actually half-Thai and half-Laotian, Bangkok Golden’s menu is expressive and colorful. Dishes are fresh, spicy, and well-balanced despite the intensity of flavor. 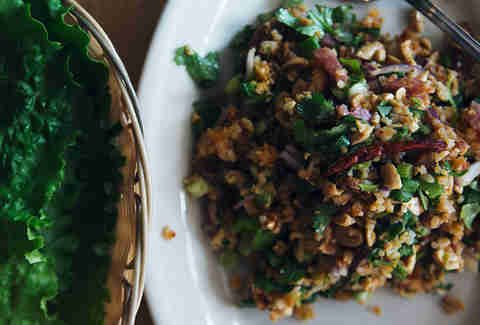 The nam khao is especially noteworthy -- a crispy rice salad served with spices, shredded coconut, lime juice, ham & ground peanuts, that, when wrapped in crisp lettuce, is a delicious rainbow of textures, flavors, and temperatures. Come for the Thai food, stay for an introduction to Laos. Even deeper into the suburban ethnic enclave of Falls Church, you’ll find Duangrat’s Oriental Food Mart. A small takeout counter in the back of a grocery store that shares a kitchen with the neighboring Rabieng Thai Restaurant (and not the similarly named Duangrat’s Thai Restaurant), the Duangrat’s takeout offers home-style Thai cooking that’s actually meant for ethnic Thai, so there is no watering down of flavor or heat. There’s nowhere to sit, but don’t be afraid to pig out on the hood of your car. It’s some of the best Thai food in the area done more quickly and affordably than most, so some sacrifices are understandable. Plus, when you’re done, you can stock up on basically any kind of Asian ingredient you can think of in the store. Beau Thai is more than just chic industrial design. There’s a trendy bar program with Chartreuse and rye cocktails, but the real star is the food. Some of the best pad Thai in the game and potent, herbaceous green chicken curry tell you that Beau Thai knows what Thai cooking is about. The newly opened Shaw location offers a number of specials not available at the Mount Pleasant shop, and that you shouldn’t miss. 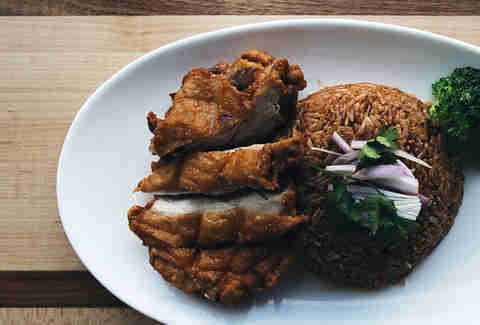 The khao pad nam prik pao (fried rice and chicken -- a staple street-food dish) is drenched with Thai chili sauce heat and fried to crispy perfection -- think of the sweet, spicy, crispy of Bonchon chicken in Southeast-Asian-chicken-rice form. 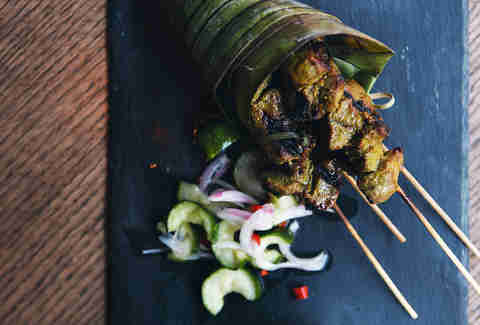 Moving up market necessitates some adaptation when it comes to cuisine like Thai. The newly opened Mango Tree in the gleaming City Center development is the first location of the international chain in the US (owner Pitaya Phanphensophon partnered with Richard Sandoval). Given its location and likely astronomical rent, one wouldn’t necessarily expect the tongue-melting spices of truly authentic Thai cooking, lest it alienate its clientele. That said, Mango Tree presents all the right flavors, albeit dialed down a bit on the heat. The green papaya salad is fresh, sweet, sour, and it does have a bit of a kick. As a way to ease into Thai food before venturing into the more face-melting realm of Thai cooking, Mango Tree is a great starting point. Extra street cred for being one of the only places in DC I have found that serves Tiger Beer. Soi 38 is unique in that it focuses on Thai street food and it has a giant dragon wrapping around the walls. The décor is bold and loud and that’s echoed in the menu. Committed to presenting authentic Thai flavors without catering to generic Americanized Thai restaurants that veer more toward sweet than really flavorful, the dishes at Soi 38 don’t pull their punches. Chili sauces and curries pop with heat and the fried catch of the day is zesty and aromatic. Though it’s not heat for heat’s sake. Dishes like the khao pad sapparod (fried rice with shrimp, cashews, and egg served in a pineapple) are bright, mellow, and savory (and how often do you use a pineapple for a bowl?). That other Thai food giant in DC is none other than Little Serow. Included on countless top 10 restaurants lists in DC year after year, and with more awards than we have space to mention, Little Serow needs little introduction. It’s not only one of the best meals in DC, it’s one of the best values. 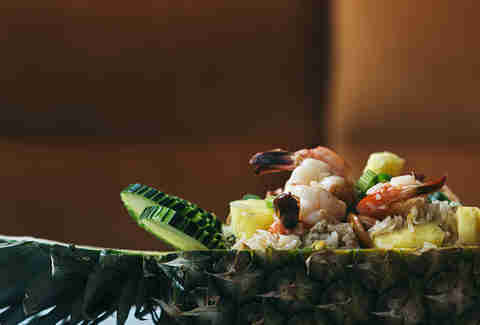 $45 for seven courses of exquisitely prepared Thai cuisine of increasing spiciness that is mercifully cut intermittently with courses of oysters or daikon. The menu changes every Tuesday and occasionally features a "fish week," but meals typically end with either the fan-favorite whiskey-glazed ribs or fried chicken. 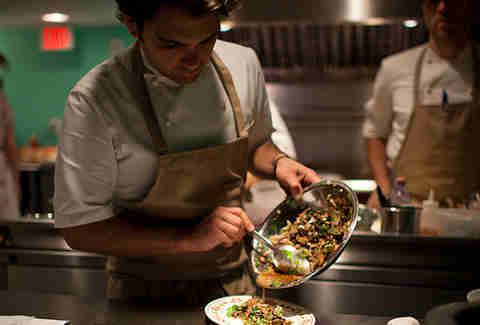 Little Serow is a bucket-list-worthy meal and one crossing off multiple times at that.